Being a bride is hard work! Organising the biggest day of your life can be pretty stressful, very expensive and, at times, a test on the strength of your relationship before you've even got to the part where you say "I Do". So taking some time out to look after yourself and enjoy some quality time with your best friends is essential to keeping your sanity and if you can also manage to get some bride prep in at the same time then it's even better. 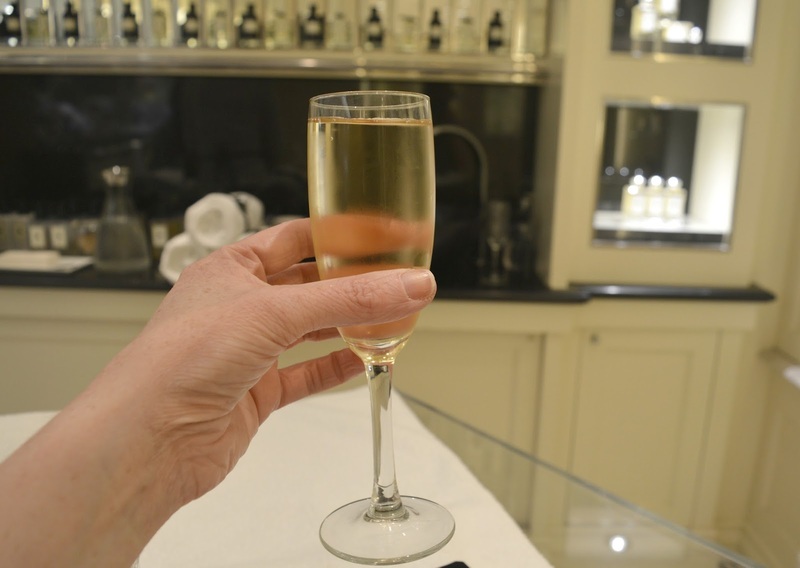 I recently booked myself in for a Bridal Consultation at Jo Malone in Newcastle's Fenwick store with my friend Sam for some pampering and perhaps a little bit of shopping. Bridal fragrances are definitely not a "must" for every bride and are a bit of a luxury. I decided that for my wedding day I wanted to treat myself and as I don't have a signature scent I was keen to have a wedding fragrance, something that I would forever be able to associate with the day I became a Mrs.
Jo Malone offer a free Bridal Consultation to all brides with absolutely no obligation to purchase and as I've always loved their scents and am after something special for the wedding I was excited to book in and took along my friend Sam to treat her to a morning away from the kids. Our consultation began with a complimentary glass of champagne each. Being engaged is a special time and enjoying endless glasses of fizz is definitely one of the perks. As we sipped on our champagne we got to sniff as many fragrances as we liked with me deciding which ones I loved and which I wasn't so keen on. We were pretty quick to realise that I like light and fruity scents and before long we had it narrowed down to two scents, both pretty popular with brides - Peony & Blush Suede and English Pear and Freesia. Sam wasn't left out and also got to have a good sniff of all the fragrances so she could pick out her favourite too. The Jo Malone Bridal Consultation is definitely a great way to treat a friend or bridesmaid and I loved that she was made to feel special too. Having picked our favourite fragrances it was time for our complimentary arm and hand massage. Using the shower gels, body creme and perfumes of our favourite scent we were each treated to a relaxing massage that gave us a great opportunity to have a good smell of the scents we loved. As I couldn't decide between my two favourites I had a different scent on each arm. I was also introduced to fragrance combining, something which Jo Malone are so good at. Their fragrances are designed to be worn together and if you're looking for a scent that's more unique it's possible to mix your favourite scents to create something perfect for you. After my massage it was clear which was the winner for me. The delicate fruity scent of English Pear and Freesia suits my relaxed country wedding perfectly and I could really imagine myself wearing it on my wedding day. 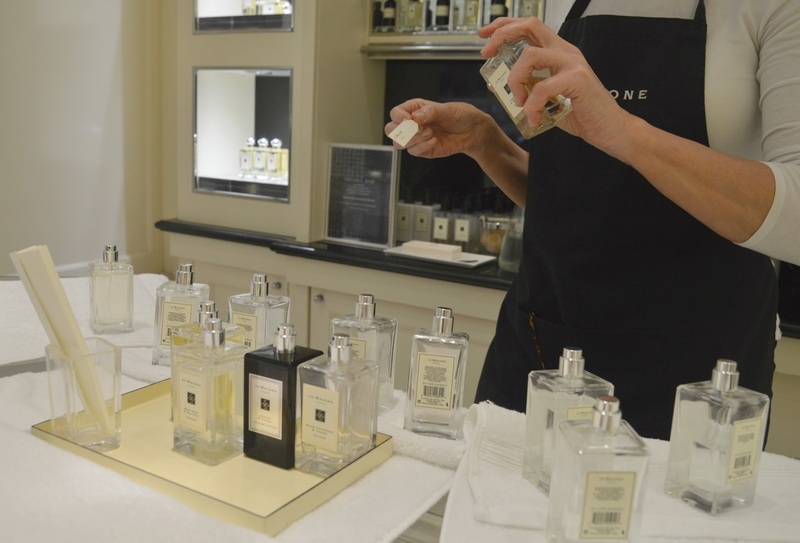 Our Jo Malone therapist offered me loads of helpful tips on how to smell great all day by using a combination of bath products, creams and scent to layer. As a bride you spend a lot of your wedding day hugging friends and family so it's good to make sure you smell great on the day. At no point during our consultation did I feel obliged to buy any of the products, in fact I was encouraged to go away and think about things if I wasn't completely sure, something that really impressed me - there's nothing more awkward than feeling like you have to buy something when you don't really want to! It was a no brainer for me, I was in love with English Pear and Freesia and wanted to be able to layer my scent to last all day. I bought a small bottle of cologne (£42), the body wash (£28) and the body cream (£50). All packaged up beautifully in a Jo Malone box I left the store one happy bride to be and it's exciting to think that I wont be opening the box again until my wedding day. Anyone else use Jo Malone on their wedding day?